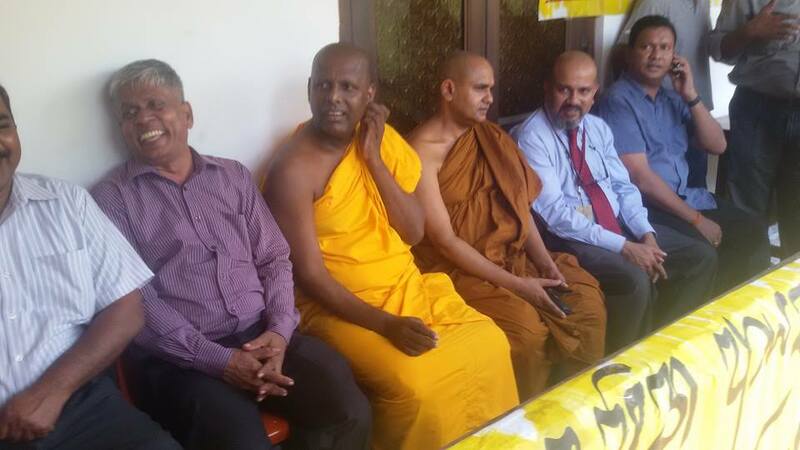 Colombo University academics have occupied the Vice Chancellor’s office urging him to resign from his position. For over a month now the academics of the Colombo University have been demanding for VC Kumara Hirimburegama‘s resignation. Today, the academics occupied the VC’s office and the Registrar’s office and they say they would continue to occupy the premises until the relevant authorities resolve their issue. “We have informed the cabinet minister for higher education Kabir Hashim about our course of action. We hope our issue would be resolved soon,” Colombo university academic and FUTA spokesman Dr. Nirmal Dewasiri said. The FUTA has been informed by its sister union, the Colombo University Federation of Teachers’ Associations (CUFTA) that they have launched a ‘sit-in’ campaign at the Vice- Chancellor’s Office of the University of Colombo, asking for the resignation of the Vice- Chancellor of the University of Colombo. As informed earlier, the CUFTA has levelled serious allegations against the Vice-Chancellor accusing him of incompetence and abuse of power. The Colombo University Senate also discussed these allegations in detail. Subsequently, the Vice-Chancellor had excused himself from the next Senate meeting. This is having serious consequences for the management and smooth functioning of the University of Colombo. While we extent our support to our colleagues and members at the University of Colombo, we call upon the authorities to settle this issue as soon as possible and to enable the University of Colombo to return to normalcy. Political stooge Colombo VC should have resigned earlier if he has any self respect. Unfortunately even Sampath at SJU is a MARA boot licker and I’ll be there until kicked out. None of theses guys got appointed the proper way. All through political connections. A Vice Chancellor cannot leave an “excuse note” in his office saying he is unable to attend the Senate meeting, but that is exactly what the Colombo VC did last month. If this is not incompetence, and downright insulting to all the members of the Senate, what is? Over and over again, this VC has shown that he is unable to handle a crisis – whenever one happens, he is absent from his office – whether it’s an issue of student hostels, or academics calling him to account for abuse of power. Can the VC explain why there are so many Acting Deans and Acting Directors of Institutes in his university? Why are confirmed appointments not made? Is he afraid to appoint competent people to these positions because then he will look even more incompetent? What is the University of Colombo’s Council doing, tolerating such mismanagement and incompetence and allowing this VC to bring the entire institution into disrepute? There is a similar crisis at the Jaffna University and the Eastern University.There is a demand by the relevant academic unions for the removal of the respective Vice Chancellors. The 100 days will lapse in a couple of days time! What about the stooge at Kelaniya? Med faculty dean @ Peradeniya. etc etc all the guys the impotent Rajiv tried to protect! May Yahapalanaya dawn on the stooges!!! Hipe academics from other universities will take a clue from Colombo. Please rise up agsinst politicization !!! This Hirimburegama guy has no academic or administrative experience at all. He was not even a Head of the Department, leave alone the position of Dean of a Faculty. Has he ever lectured? This guy got the position of lecturer thanks to his wife who got the lecturer position thanks to her parents. The huge mistake SB and Mahinda did was giving positions to their henchmen. Up until 2010, it was always a Dean who became the Vice Chancellor. Now, look at the University system, how many political stooges are there as Vice Chancellors who never became a Head or a Dean. It should be made mandatory that only people with substantial administrative experience such as Dean of a Faculty can apply for the Vice Chancellor position. Otherwise these politico academic jokers will destroy the system.